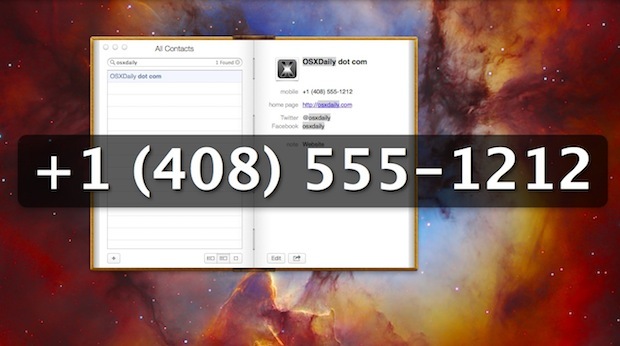 If you’ve ever needed to retrieve a phone number from Contacts (once called Address Book) in Mac OS X, you’ve probably noticed the phone numbers are shown quite small. On larger screens that’s not too big a big deal, but on smaller screen Macs and those with high resolutions, it can be really quite small. Rather than leaning your face inches from the screen or squinting like crazy to read a phone number, Apple thought ahead and added a great little accessibility feature that greatly amplifies the size of the phone number, making it simple to dial without wondering if you’re seeing the right number. If you recall the Contacts trick to send text messages, SMS, initiate FaceTime calls, and Skype chats, then you’ll be familiar with the largely hidden menu used to access this feature. The super-sized text will stay on screen until you click anywhere, then it will will disappear instantly. This is an excellent app-level accessibility trick for anyone with visual impairments, if you forgot your glasses somewhere, or if you’re just tired of squinting to see the itty bitty phone number in Contacts. Now, if only iOS had the same type of option, we’d be all set! I know it has nothing to do with this article, but I just reply here, because this is the latest article you posted. I just want to tell you (I’m not sure if you’re aware of it), but since a few weeks there’s been a bug on your website. On the front page when I scroll down to the end and then click on the link to go to page 2 it shows articles from a month ago, instead of those from a few days ago. Can Contacts be scripted to show this? I’d assign a keyboard shortcut to it and use it frequently. I haven’t figured out how to get this to appear other than with a mouse click and would prefer a keystroke. The free TapDex app also has a similar feature which has proven very useful to me. Opt-F1 brings up the info without opening the Contacts app, then tapping the phone number enlarges it. Well this didn’t work for me, it just started a call. I did exactly what you said and clicked on the text next to the phone number. I right-clicked and it did show it. Another method that works is open Dashboard -> Contacts widget -> Search for contact, click on number. It does the same thing by default. This app is so funny, it reminds me so much of those old school home telephones with the giant dial keys. It also remind me of that Clint Eastwood movie, Gran Torino, in which his daughter and son in law give him one as a “gift”. His expression is disdain is priceless. And it pretty much looks as mine in this scenario. Both my parents and parents in law have a hard time to read small print but this is a bit too much.